Sponsored by the International Testing Commission, The ITC Handbook of International Testing and Assessment is dedicated to the advancement of theory, research, and practice in the area of international testing and assessment in psychology, education, counseling, organizational behavior, human resource management, and related disciplines. Bringing together international contributors from a range of disciplines, each chapter provides a review of testing and assessment research and practices around the world as well as a discussion of conceptual and methodological challenges to help advance the field. 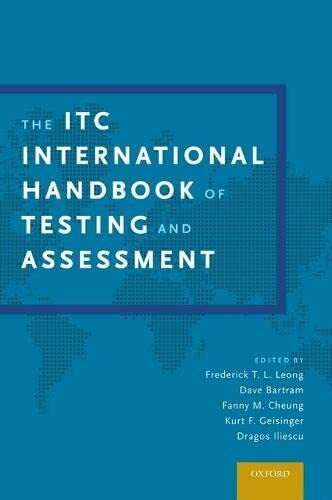 As The ITC Handbook, it also provides a historical perspective of international testing, the development of the ITC, and its guidelines. Recognizing that cultural and international contexts are essential to a true and accurate psychology, the authors describe how cultural, economic, political, and social factors in different countries frame the science and practice of testing and assessment. The ITC Handbook is a must-have resource for testing professionals and graduate students from psychology and related disciplines. Dr. Frederick Leong is Professor of Psychology and Psychiatry at Michigan State University. He is affiliated with the Industrial/Organizational and Clinical Psychology programs and also serves as the Director of the Consortium for Multicultural Psychology Research at MSU. He is Past President of the Asian American Psychological Association and the Society for the Study of Culture, Race and Ethnicity (Division 45 of the American Psychological Association). Dr. Dave Bartram was President of the ITC (2014-2016). He was Chief Psychologist for CEB (formerly SHL) until July 2016. Prior to his appointment with SHL in 1998, he was Dean of the Faculty of Science and the Environment, and Professor of Psychology in the Department of Psychology at the University of Hull. He currently holds an honorary Chair at the University of Pretoria. Dr. Fanny Cheung is currently Vice-President (Research) and Choh-ming Li Professor of Psychology at The Chinese University of Hong Kong. She is a former President of the ITC (2012-14), a past President of the Division of Clinical and Community Psychology of the International Association of Applied Psychology, and a Fellow of the American Psychological Association and the Association for Psychological Science. Dr. Kurt F. Geisinger is currently Director of the Buros Center on Testing and W. C. Meierhenry Distinguished University Professor at the University of Nebraska. He served two terms as council representative for the Division of Measurement, Evaluation and Statistics in the American Psychological Association, on APA's Board of Directors, and he also represented APA on the ISO's International Test Standards committee. Dr. Dragos Iliescu is a Professor of Psychology with the University of Bucharest (Faculty for Psychology and Educational Sciences). He has been active as an academic and as a scientific consultant for the past 15 years, being involved in and having led important consultancy, assessment and test adaptation projects in Romania and other countries, mainly in Eastern Europe.